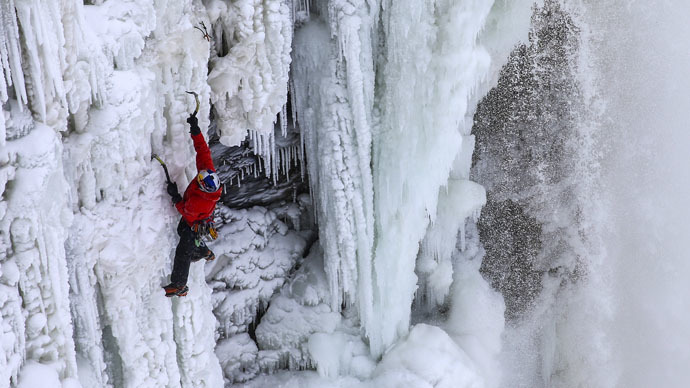 “I was climbing Niagara Falls – how cool is that?” Will Gadd, 47, said of the iconic natural landmark, which threatens to either engulf you in thousands of truckloads of raging ice water per second, or break every bone in your body. The vertical climb is 150 feet of constant regrets at every turn, as it would appear to an ordinary human. The low-frequency noise the waterfall makes is enough to scare the best of us. But Gadd is anything but an ordinary human. And he chose the most treacherous of Niagara’s three sides to prove it – the Horseshoe Falls, described by other climbers as 'unclimbable'. “What really fires me up about doing any sort of climbing is figuring out a problem and solving it well in an interesting and cool way. For me this is just figuring out a puzzle,” he said. There were a few hiccups on the way, which is no small thing, all things considered. Halfway up the raging white mist, which travels at over 70 miles an hour, Gadd’s ice picks froze due to the water spray mixing with the ice. This required manually prying them away from the ice before he could go on. Despite what one may think, climbing Niagara Falls is not a one-man effort. Gadd has had to jump through a myriad hoops, just to get permission for the Red Bull-sponsored climb. And even then, he says he could hear someone yelling “Stop! You can’t do that!” just as he was reaching the summit. Climbing is an incredibly demanding sport, and Gadd probably would not have been so expert at it, had it not been for his general athleticism – he also enjoys hockey, skiing and paragliding, among other things. He has gained worldwide acclaim for the latter.